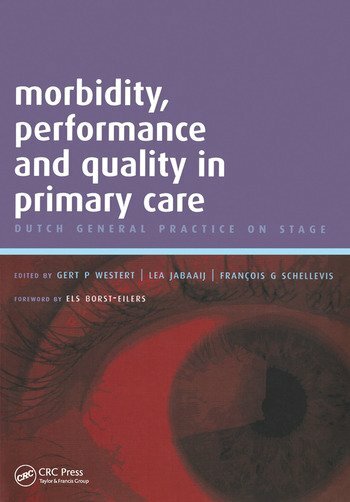 This book is based on the findings of a nationwide study, the aim of which was to analyse general practitioners' performance as gatekeepers of the Dutch healthcare system. The study was undertaken along six themes: the health of the population; inequalities in health; utilisation of care; quality of care; communication; organisation and workload. Morbidity, Performance and Quality in Primary Care involves 400,000 patients, 1.5 million recorded GP-patient contacts and 2.1 million drug prescriptions. This survey appears at a timely moment. It coincides with the recent interest in primary care arising not only from the growing importance of cost containment in healthcare, but also from the now firmly established association between the life expectancy of a population and the existence of a strong primary care sector. The international interest in the Dutch situation is reflected in several chapters, where experts from all over the world put Dutch general practice into an international perspective. General practice in the Netherlands; major findings from DNSGP-2. The design of the second Dutch national survey of general practice. The Dutch health care system: how are we organised? Primary health care as a determinant of population health: a social epidemiologist's view. Morbidity in the population and in general practice. A comparison of disease prevalence in general practice in the Netherlands and in England and Wales. A matter of disparities: risk groups for unhealthy lifestyle and poor health. Child's health and general practitioners' management, 1987-2001. Patients with a psychiatric diagnosis in general practice: (co-)morbidity and contacts. Perceived health and consultation of GPs among ethnic minorities compared to the general population in the Netherlands. Respiratory tract infections in general practice according to age, gender and high-risk co-morbidity. The activities of general practitioners: are they still gatekeepers? Prescription in Dutch general practice. Medical practice variation: does it cluster within general practitioners' practices? Social networks and receiving informal care. The workload of general practitioners in the Netherlands: 1987 and 2001. 'Doing better but feeling worse': changes in the workload of general practitioners in the United Kingdom. Professionalisation of the practice assistant enables task-delegation: 1987-2001. Communication in general practice. Have gender preferences and communication patterns changed? Quality of primary care. Assessment of primary care by clinical quality indicators. Practice visits in the Dutch national survey of general practice: a useful research instrument for data on practice management. Quality of GP-care from the patients' perspective: facts, trends and differences. Adherence to pharmacotherapeutical advices in the guidelines of the Dutch College of General Practitioners. Activities of the general practitioner: are they important? Health status of the elderly in the future: demography, epidemiology and prevention. Need for general practitioners in The Netherlands until 2020: an exploration of demographic and epidemiological changes in general practice. Supply of GPs in the Netherlands. Collecting information in general practice: 'just by pressing a single button'? The future of data collection in general practice in Belgium.